Tunnel Hull Performance and safety: 2Tinga boats are built on the tunnel hull platforms, What this means is, instead of plowing through the water..., pushing the water out of the way as you go..., we ride on a cushion of air inches off the water, and we enjoy all the benefits of this technology. Tunnel hull boats are fast, stable and safe. The Challenger offers everything! "Hi-Jacker tubes" are added to the running surface creating a deeper tunnel. The benefits are increased fuel economy, stability, unmatched handling and performance. 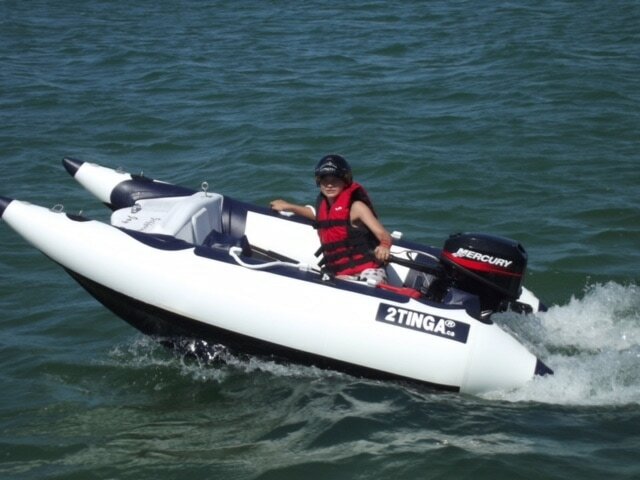 If you are looking for a yacht tender, sport boat or even competition, this is our most popular series in the recreational inflatable boating market. The Challenger 1000 is a 10 ft high performance tunnel hull boat with "highJacker" tubes! Extremely fast and stable. 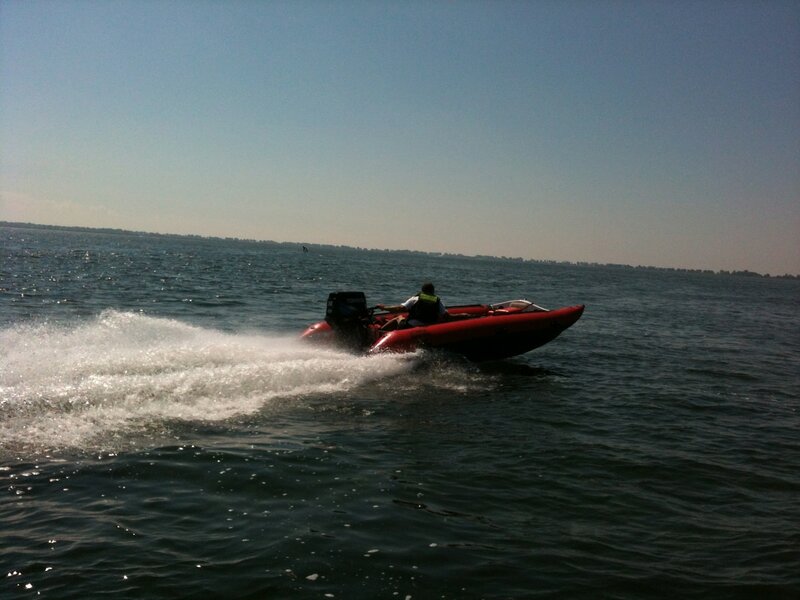 It is not as fast as the other Challenger Series, but very comfortable and smooth ride. It is also an excellent working platform, very tough. Use this boat as a tender but get ready to enjoy the fun that comes with this small package. This boat is not for the timid. Very stable but performs like the bigger boat. Our tenders have an open transom and some consider them a wet ride when you are being aggressive, but it is worth it. We recommend a 15 to 25 Hp outboard motor. Custom Graphic to match your boat and a total weight of 135 lbs. This is the ultimate tender....,never loose a tender race again! Mind bending performance and unbelievable twisting and turning. Great water toy! The Challenger 1300 and 1600 is a 13ft and 16 ft high performance boat that will blow your mind...., this is a fast, most rugged and multi-purpose boat that we have. Yes this can be a race boat, but it is also what marine units are using for water rescue. 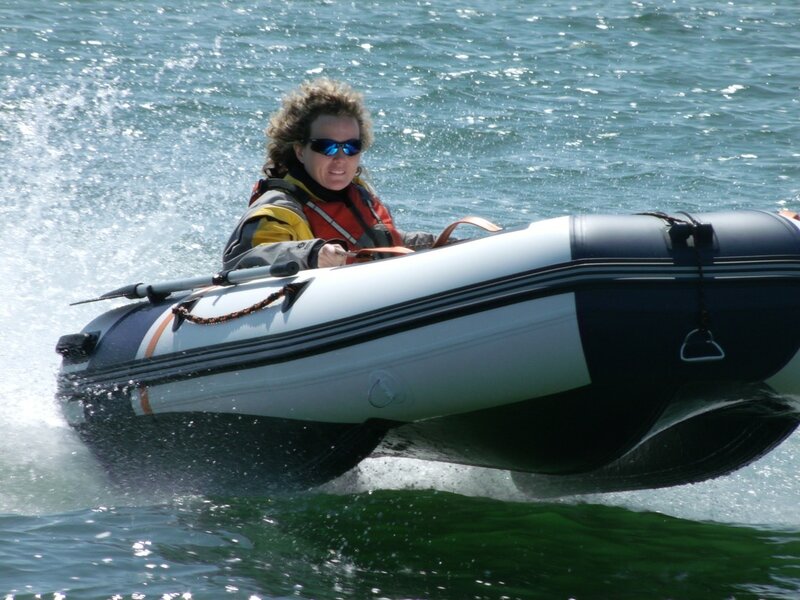 The 16 ft is stable and safe high performance boat that is just perfect for the cottage. A boat that is big enough for the family. No need for a dock, and just roll it up and store it in the cottage for the winter. Many colours availble at no extra charge! The Survival Series offers a larger diameter inflatable tubes, larger beam (width) and larger cockpit. This is our heavy duty version of our Challenger Series specially designed for high loads, like ATV to the cottage or additional equipment space to help manage your heavy loads. Built with the "Emergency Responders" in mind. 2TINGA™ Inc. boats are made to withstand the most punishing of conditions. The tunnel hull design is ideal for the ice rescue , as these boats will slide across the ice with very little friction. They will not freeze to the ice below. In water, 2TINGA™ Inc. boats will turn instantly with little or no cavitation, 90 degree turns are common. Due to the fact that our boats have a rigid floor that is off the water, you have very little drag. Which makes the boats very fast. Survivor Series comes in 16 ft to 18ft length and 8' wide. Huge pay load! Simple to maintain and clean! Large floor space for whatever you need. 2TINGA™ Inc. transom have a ten year warranty and are made of a 3/8 square aluminum tubing or 4452 Steel. Open wash through transoms. This boat can carry the weight of 9 people. If you require any custom modification we will be happy to help you with your request. For those of you that need more room and a perfectly dry ride, we now offer the Explorer series. This boat still uses tunnel hull technology riding on top of the water. A lot more usable room, a higher freeboard and more storage space. A little less performance then the Challenger series, but very easy and safe for anyone that drives the boat.